This site is being constantly updated and any new items and details being added on almost a weekly basis. If you have any questions then please feel free to e-mail us for further details. The website is designed to work with Microsoft Internet Explorer but may work with other web browsers. Also some firewalls have strange effects, so be aware. It may be "belt-and-braces" technology but it works. The site is also just an online catalogue, it is not an online shop. To order just use the good old-fashioned phone! Use the navigation side bar on the left hand side to look up the various scales and the ranges in those scales we stock. Update on the forthcoming Dapol Autotank as we have now received the first of the colour layout images. There will be several options of each type with the changes through the life of the loco and the options of autofitted. Overall, including both the DCC fitted and DCC sound options along with the option of un-numbered for those customers who wish to complete the loco as their own specific loco there are fifty versions being produced! 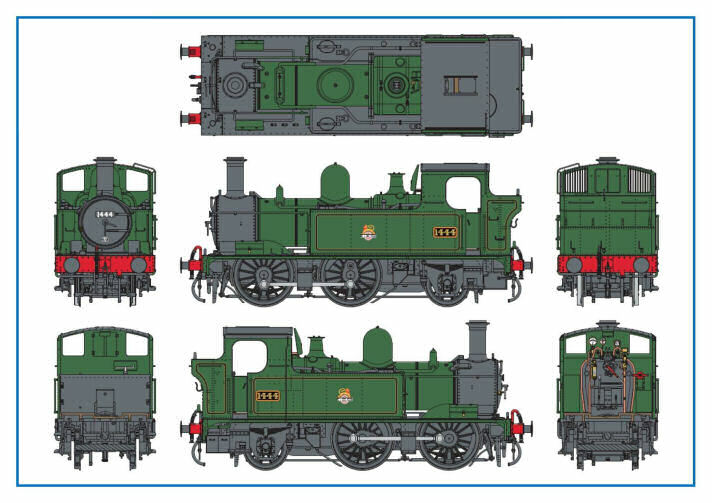 We will also be offering our completing service for these locos for those people who wish to have their own number applied by our workshops and also the option of weathering if required. Numbering with the customers own number costs an additonal £35.00, weathering an additional £25.00. Dapol at the same time have given an update on the expected release date, which they are now saying will be the last quarter of 2019, so hopefully in time for Christmas. We are taking advance orders for these now for despatch as soon as they become available. The DCC and sound fitting is being done here in the UK so will become available a few weeks after the standard models. Heljan Class 03 - Almost completed, factory painted test samples expected soon. Heljan Class 50 - decorated sample on route and expected release September. Train of the week is a new feature that started in August last year and we hope to feature every week subject to how manic it gets with new product launches. Of course it is subject to how succesful the concept is and on going sales from it but it is not just about that it is also about showing ideas and putting together locos, coaches and wagons from various manufacturers together into a realistic train. Most featured items are standard stock items and we can always recreate it again to customer's own specifications with either more or less items of rolling stock or even different liveries as required. Full details can be found by clicking on the title which is the link to the specific webpage for this feature. As such even when completed and sold we will leave them on the webpage as inspiration for short, simple trains that you may want to tackle yourself or leave us to do for you subject to items still being available and a new "Train of the Week" should be added every Thursday and we intend changing the era and type of train to keep it fresh and different. 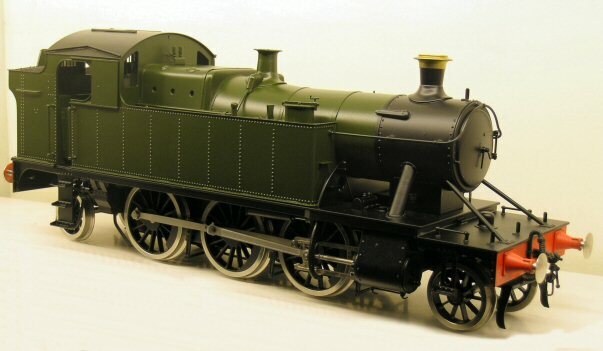 DJH Engineering have had a price increase on both the DJH and Piercy range of O gauge kits. The new prices came into effect on the first of the month and sadly we did not have any advance notice of the increase. Dapol have confirmed that the " Steetley" Lime Wagon should be out before the end of the month. At the same time they have announced two new liveries of the Salt wagon; these being "Tees Salt" and "S Waterhouse", again both of which should be out before the end of the month. Dapol have also announced that with this batch they will also being doing factory weathered examples of each of the above liveries. If you wish to take advantage of our advance ordering system, we are taking order on these three wagons now for despatch as soon as they become available. Following the Heljan limited re-run of some of their Mk1 coaches at a new lower price, Heljan have now extended this to cover the remaining stocks of both the BG and GUV. At the new lower our price of just £169.15 instead of £250.00 they represent excellent value for money. We have also made the decision to include the Tower Models Limited Edition maroon variants in as well whilst stocks last even though we did not benefit from the new lower price on these. First come first served at these prices. At the Alexandra Palace show last weekend Dapol had the first decorated samples of the forthcoming Y1 / Y1 Sentinel on display which are currently under review by the Dapol design team. Although they are only test sample images it does give a good impression of the liveries being produced. The expected released date is hopefully around Mid Year (June or July ?) and we are now taking advance orders for these for immediate despatch as soon as they become available. Advance ordering is highly recommended as this is bound to be popular. Dapol have also now announced a ready to run steam heated banana van for release hopefully around Christmas 2019. Initially four will be available; two different numbers in "Geest" and two in "Fyffes" livery. 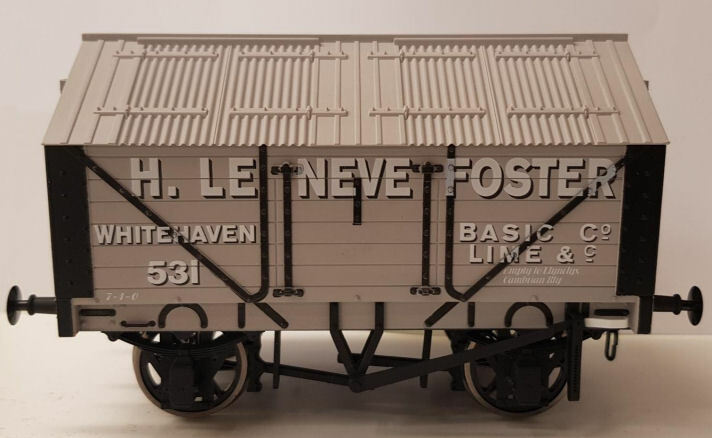 At the same time Dapol have also announced the release of additional number variants of the Hybar open wagon, insulated van in white and both planked and plywood standard vans. We are taking advance orders for all of these for despatch as soon as they become available. 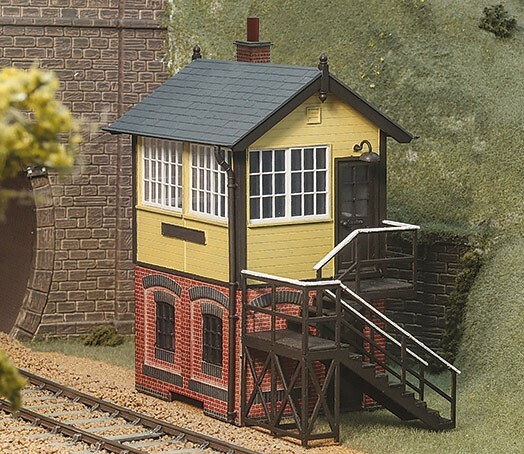 Peco have just released a new addition to their O gauge range of trackside kits with a signal box, representing a generic style of box with a brick base and wooden cabin structure on top, plus the necessary steps leading up from the ground. This is a "mixed-media" kit, meaning that the top half is produced as a plastic injection moulding, and the brick base of laser-cut wooden parts, all coming together to create this wonderfully characterful structure. Provision has also been made to include a brick chimney breast at the back of the box. These arenow in stock and are available for immediate despatch. 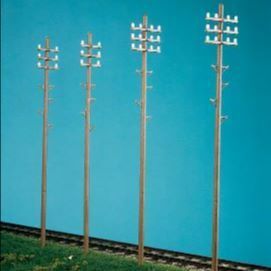 At the same time Peco have decided to repackage their O gauge telegraph from the original pack of 4 to packs of 6 but with a price change from the original £6.50 per pack to £9.50 per pack. We still have a handful of the old packs of 4 but once the last few we have in stock have gone all future stocks will be at the higher size and price. 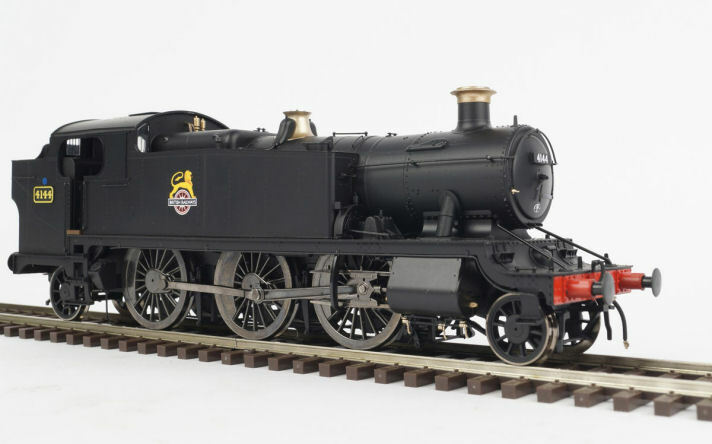 Dapol have announced a re-run of their popular 57xx and 8750 Pannier Tanks for release late 2019. This will include the introduction of a new riveted tank variant that has not been done before. Details of these liveries can be found on the webpages for these through the title link. We are taking advance orders for these now for despatch as soon as they become available. The GNSR lined Caramel livery sounds interesting and I look forward to updates on these liveries. At the same time Dapol have announced a re-run of the 0-6-0 3F Jinty. We are taking advance orders for these now for despatch as soon as they become available.. The BR liveries are always popular and advance ordering is highly recommended. The Heljan Class 43xx Mogul are now all in stock and have been well received. Stocks are already running low on these with just a handful of the two "Great Western" liveried examples remaining. Listening to customer requests Heljan have now created a supplementary instruction sheet for further details on how to disassemble the locomotive for DCC fitting and general maintenance. A copy of this I have now put a link to from the webpage for the 43xx Mogul which can be reached through the above title link . We have just received test sample images of the forthcoming Heljan Class 03. The example here has been hand painted by Brian Daniels. Good progress has been made with these in recent weeks and although a few little tweaks are now being made, Heljan are confident that we’ll see them arrive by late-summer/autumn. There has also been a price change on the forthcoming Class 03, the new RRP now being £395.00 with our price £335.75. They have now confirmed there will be 4 options for each of the three basic liveries; conical chimney both numbered and un-numbered and then flower pot chimney both numbered and un-numbered. Heljan have now also confirmed two further liveries for the Class 03 in industrial service. We are taking advance orders for these now for despatch as and when they become available. Latest predicted release date for these is now late summer and will update the website as and when we get more information. Following a customer poll on Heljan's Facebook page a very limited batch of GB Railfreight 50049 Defiance has now been added to production run. It will be on general release, but a very short run and is expected to be very popular, so advance ordering is highly recommended. Heljan have also stated that they may do more customer polls via their Facebook page in the future to tailor some short run locos to what customer's want on other future releases. We are taking advance orders for these now for despatch when they are released but there has been no confirmed release dates as of yet but latest estimate is August 2019. As always we will be offering our naming, numbering and weathering service on these as well as our sound fitting service if required. We have also just received from Heljan images of both the undecorated test sample of the Class 33 and also a hand painted image of the Class 33 in Dutch livery painted by Brian Daniels. The colour layouts are done and I hope to have copies of these soon, then we are just waiting on the final decorated samples and then they can go into production later in the year. 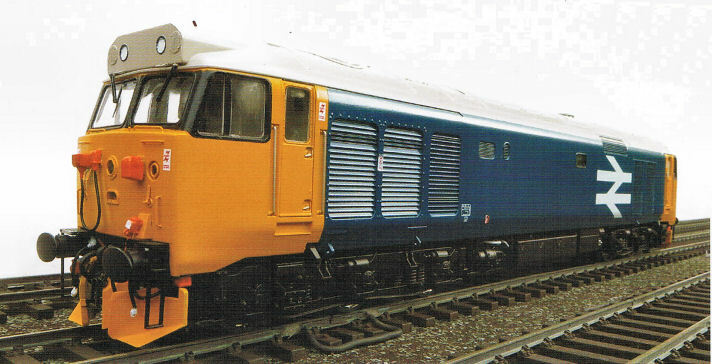 The reintroduction of the the Class 33 will have much improved tooling and with two body types to cover the earlier and later body types and liveries. We are taking advance orders for these now and as always we are offering our numbering and weathering service for these as and when they become available for those people who wish to take advantage of this. One change from the original announcement from Telford show on these is that the realistic release date is late 2019. More details will be added as and when we receive them from Heljan. Heljan have also announced a re-run of the ever popular Class 35 Hymek. A total of four liveries are being produced. During preparation work to rerun the very first O gauge loco that Heljan produced , it was found that various modifications were needed to bring it up to modern standards. These are now in hand, but it does mean that re-release will be somewhat later than originally expected. Modifications will include weight reduction, LED lighting to replace bulbs and an electronics upgrade to make it easier to convert to DCC. Now expected in 2020. We are taking advance orders for these now for despatch as soon as they become available. As with the reintroduction of both the Class 31 and Deltic, these are very short re-runs and advance ordering is highly recommended. We have also received this week stocks of the brand new ESU v5 XL chips. We have been waiting for these for sometime now and there is a queue of locomotives in the workshop awaiting sound fitting with the long awaited new sound card. Good news is that we will be able to maintain the standard chipping charge for these @ £310.00 for Heljan locomotives even though there has been a price increase from ESU on the unit. This may change post Brexit dependant on the terms of the final Brexit deal and whether there is an import duty on European goods but at the moment it is impossible to say what effect it will or wont have. We will worry about it if and when it happens. Stocks are begining to run low on the popular Dapol HAA Hoppers. We have now completely sold out of the brown cradle liveried versions and stock are low on the yellow cradle livery. Dapol have also completely sold out of both of these liveries so we cannot replace them once they have gone. Stocks are okay on both the blue and red cradle liveries for the time being but wont last for ever. We have received today from dapol the test sample images of the forthcoming re-run of O gauge Autocoaches that are due for release mid year which includes a couple of liveries they have not done before. All liveries of the autocoaches will be available as the basic model, DCC ready with a light bar or DCC fitted with a light bar. I have updated the webpage for these and we are taking advance orders for these now. We still have stocks of a few of the coaches that were released earlier this year available for immediate despatch. Last year the lined out Great Western Chocolate and cream livery shown above was extremely popular and advance ordering of this livery in particular is highly recommended. As always we are offering our weathering service if required at an additional £40.00 per coach. At the same time Dapol have also confirmed the long awaited re-run of Air Ministry tankers is now in production in China. Given that it is Chinese New Year any day now and the delays this entails we expect delivery hopefully in late March or early April if everything goes to plan. At the same time we will be receiving our two Limited Edition sets of six tankers from Dapol. Both Shell BP and Esso have always been the most popular of the liveries of the Class B ex-Air Ministry tankers. As such we thought people might appreciate the chance to buy sets of 6 of these all with different running numbers that have not been done before by Dapol. Advance orders have been good on these but we are still taking advance orders for these whilst stocks last. We will also be offering our custom weathering service on these for those people who want to take advantage of it. At the same time Heljan have announced a re-run of the Class 55 Deltic which should become available around the end of the year. A total of four liveries are being produced and includes the BR green with full yellow end livery that is both named, numbered and factory weathered that has not been done before. Numbers will be low so taking advantage of our advance order system is highly recommended for these for despatch as soon as they become available. 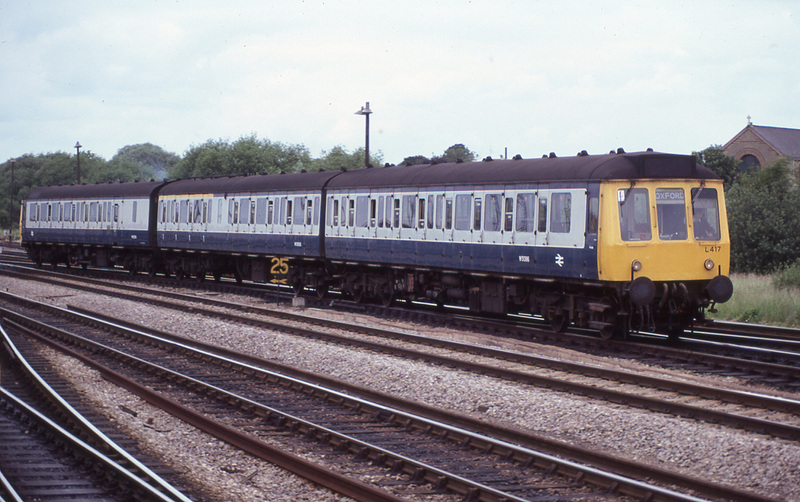 Again before the end of 2019 Heljan have announced a re-run of the ever popular Class 31's. A total of six liveries are being produced that includes four that have not been done before; BR Green with full yellow ends, BR electric blue, Yellow Ochre and RTC livery. No exact dates given but again this is expected before the end of 2019 and we are taking advance orders for these now for despatch as soon as they become available. As with the Deltic, these are very short re-runs and advance ordering is highly recommended. I have now updated the dates for all the show we are attending in 2019 after final confimation of the date for Reading in December next year. 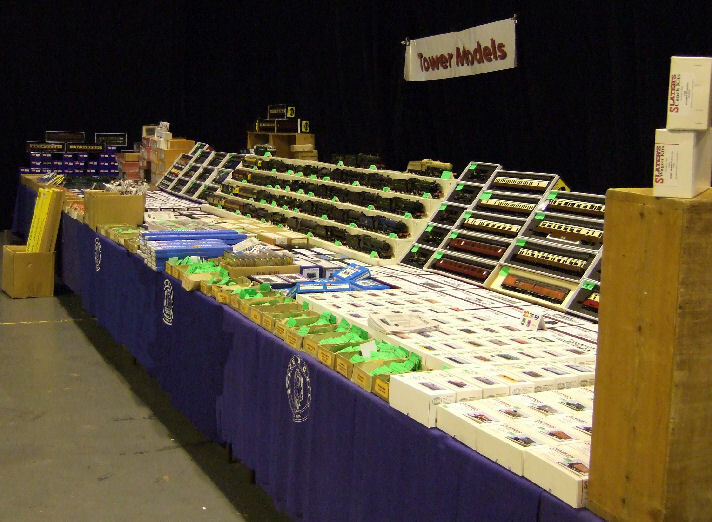 If there are items you wish to collect at any of the shows it really does help us if you advance order items as space in the van is always limited giving the growing number of items available in O gauge. The workshop has just completed a weathered example of the Dapol BR Terrier which I have added to the list of ready to run locomotives available off the shelf. All of these are available for immediate despatch. Couple of updates from Dapol today in regard to forthcoming releases. 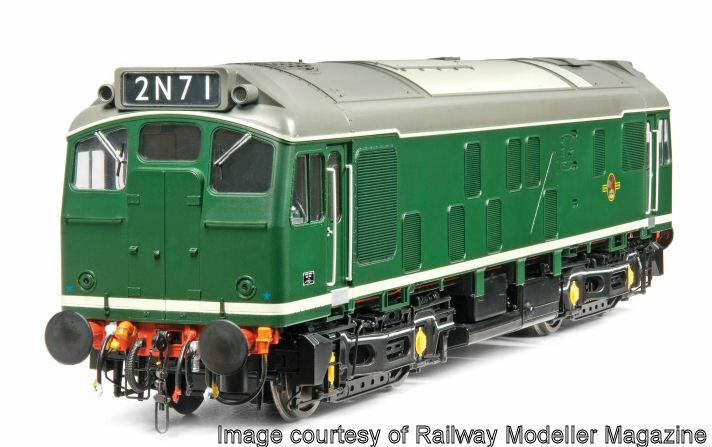 Dapol Class 121 - Expected June or July. In regard to the forthcoming re-run and Limited EditionTower Models tankers sets, Dapol have now received some but not all of the decorated test samples. Once they have had and approved all of the test samples they should be going into production so hopefully available in March so long as they are all approved. Following the success of the centre headcode Class 37/0 Heljan announced the production of a Class 37/4 which should hopefully be released in February 2019. The lists of liveries that are being produced has now been updated with the addition of an Intercity livery. We have now also had an image from Heljan of a test sample . We are taking advance orders for these now and I will update the website as and when we get more information in the coming months. As always we will be offering our naming, numbering and weathering service on these. Whilst mentioning Class 37's it is worth mentioning we still have very limited stocks of the centre headcode Class 37/0 in later liveries but only a handful are left. The Class 47 has been synonymous with the UK railway scene since their introduction in 1962. The Heljan 'O' gauge class 47 was originally released back in 2006 and they feel it is now worth re-visiting and so development is now well underway on a completely re-tooled model. Heljan announced the production of the Class 47 in January 2018 and have now finalised the details on the all new tooling of the Class 47. There will be two versions; the 'as-built' Brush type 4 / Class 47 covering the 1960's and 1970's and later variant covering the 1980's and 1990's; both will feature 'full' rather than 'cut-away' bufferbeams, but will incorporate a number of detail differences reflecting some of the many changes/developments the class has been through during their long lives. We now have a provisional list of the liveries that are being produced but this may well still change. Provisionally they have indicated a release towards the end of 2019 but I would be surprised if it runs into 2020. We are now taking advance orders for these now although we are still awaiting confirmation of the price of the loco but it is expected to be in line with other recent releases. We have now completely sold out of all liveries of the Class 55 Deltic. 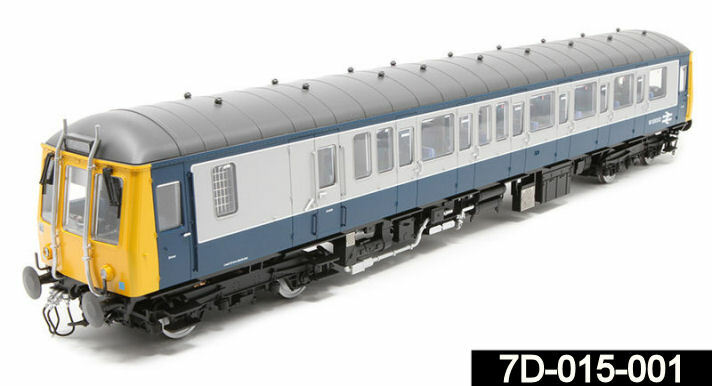 Heljan have announced an O gauge Class 17 Clayton for release late 2019. Provisionally four liveries have been announced but others may be added later. Hopefully we should have test samples images in the first quarter of 2019 and we will update the website as and when we get more information. We are taking advance orders for these now. 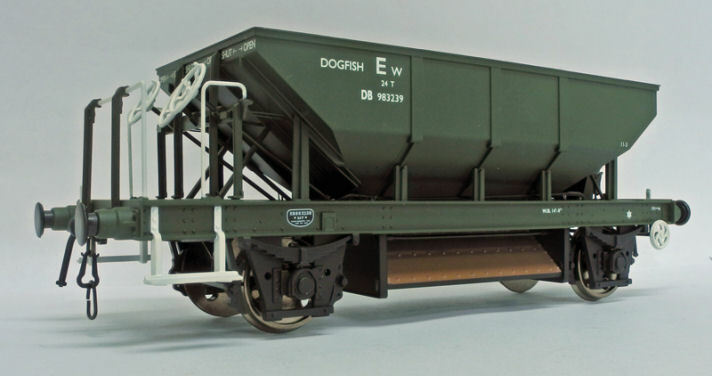 As with the Salt and Lime wagons we should see the first examples of the brand new Dapol 9ft RCH wagons are now available. Again there have been a few new liveries announced that are being produced first. The originally announced private owner liveries will follow in either December or January. We are taking advance orders for these now for despatch as soon as they become available. 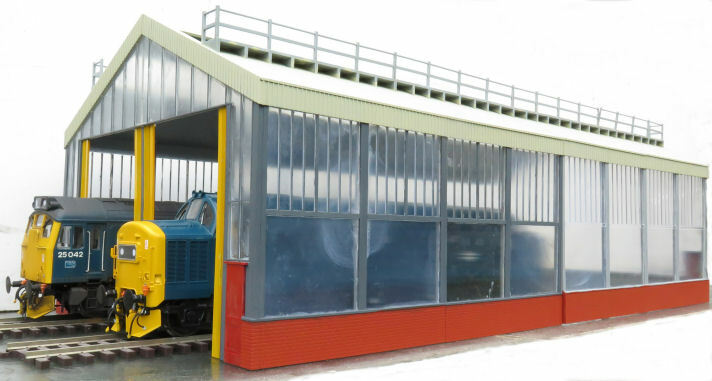 Dapol have confirmed this project is running late and have now revised the projected release date for the Small Prairie to the second quarter of 2019. Dapol have been working on improvements to the original Lionheart model which have taken some time to complete. . Quantities being produced will be low so advance ordering is highly recommended to avoid any potential disappointment, especially in regard to the sound fitted option. These are diecast model rather than plastic at very keen prices. The Heljan Class 25/3's arrived yesterday and we have been busy arranging deliveries for all the customers with advance orders. We have now despatched, or arranged despatch for 99% of customers. We currently have stocks of all versions available off the shelf for immediate despatch. There is also the option of both numbering and weathering for those people who wish to take advantage of this service. A simple call can secure yours now. Dapol have also this evening confirmed a change in running numbers and reference numbers on the forthcoming Class 122. As the primary concern for most people is the livery over the running number we have automatically transfered all advance orders over to the new refence codes. If people would like to change their advance orders as the number is more important then just let us know. Hopefully this should become available around the end of the year with the sound equipped versions probably available in the New Year. It has been an interesting few days with the launch of the Dapol brake vans. Luckily we noted everyone's choice of both livery and era required for customer advance orders rather than just the reference numbers to ensure everyone got the model required. Labour intensive but worthwhile to avoid any issues. The website now shows the correct stock numbers and liveries compared to what was originally announced and we also have the first images from the workshop of the weathered examples that have just been completed. Initially being produced is the main series of brake vans encompassing Diagrams 1/504 (vacuum through piped) and 1/506 (Unfitted) manufactured between 1951 and 1957 totalling some 2,300 vehicles. We are taking advance orders for these now for despatch as and when they become available . Demand for these has been very high and we expect them to sell out quickly once they are released. A good suggestion to accompany these is the set of 5 Springside BR tail lamps or BR Guards lamps at £9.50 per set which we could add to the order if required and as always we are also offering our weathering service for these for those people who wish to take advantage of this at an additional £25.00. With the current workload the weathering service is expected to take between 10-14 days after launch. The new issue of the Dapol 10ft wheelbase vans and opens also appeared the week before last. The workshop have now also completed the first weathered examples of these.. Details of the full range available in this batch can be found on the relevant webpage and all versions are currently available. A total of six named and numbered models are now available. We can also rename them and offer our own weathering service if people require it. Demand has been higher than expected and already Heljan are out of three versions and the others will not last long. I have now updated the webpage for these with the ones we are running low on and once gone we cannot replace. The new batch of Dapol Terriers are now in stock. There are a total of 5 new liveries covering both A1X and A1 versions with the option on all of analog, DCC fitted or DCC and sound fitted. We are taking advance orders for these now for immediate despatch as soon as they do become available. As always the DCC fitted and DCC sound equipped models are available usually two to three weeks after the analog version is delivered. We still have stocks available of all five liveries available for immediate despatch for anyone who did not take advantage of our advance ordering system. There are a total of twelve versions of this both numbered and un-numbered now in stock. We currently have stocks of all twelve types but the numbers on the most popular ones are getting low. Heljan announced the long awaited Class 56 at Telford show for production in 2020 and initially eight liveries are proposed. We are taking advance orders for these now for despatch as soon as they become available. The price for this has yet to be settled but we will update the website as soon as we get more details. This is quite a beast of a loco and will feature some new specification which they have not catered for before including provision for a smoke unit, designed with DCC and sound fitting in mind and see-through grilles. Again we will be offering out numbers and weathering service on this loco. At the same time Heljan have also announced the production of the GWR / BR Razor Edge Railcar for production in 2020. There are currently six proposed liveries for production but this is still to be confirmed as is the price. As and when we get more details we will update the website and we are taking advance orders for these now. Alternatively we produce the same model in the Tower Brass range which is available in plain brass with a black chassis or fully finished for those people who do not want to wait. I have now updated the website with the details of the forthcoming O gauge Bogie Bolster 'E'. One slight change from the flyer seen at Telford show is the release date is now predicted to be second quarter of 2019. We are taking advance orders for these now for despatch as soon as they become available. We will also be offering our weathering service on these for those people who wish to take advantage of this service. I have now updated the website with the details of the forthcoming O gauge Turbot Bogie Ballast Wagon. One slight change from the flyer seen at Telford show is the release date is now predicted to be second quarter of 2019. We are taking advance orders for these now for despatch as soon as they become available. 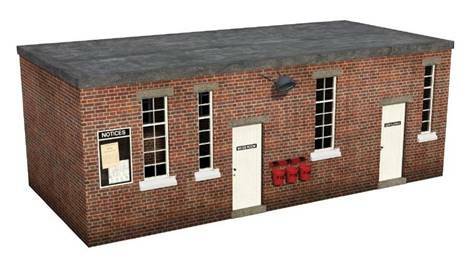 We will also be offering our weathering service on these for those people who wish to take advantage of this service..
Bachmann have announced another O gauge building for release early 2019 for a Depot mess room and toilets. 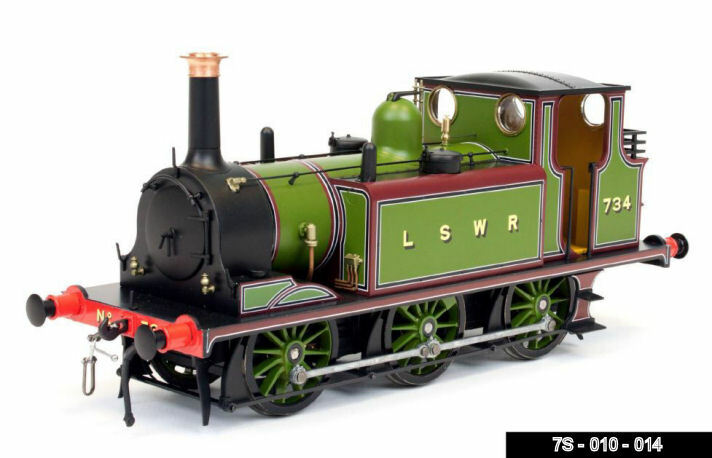 I have now added this to the other six new Bachmann Scenecraft items that have been announced for release. Bachmann have now updated the release date for all seven buildings to "Early 2019" and they should all appear at the same time if everything goes to plan. We are taking advance orders for these now for despatch as soon as they become available. As and when we get a better idea of the launch date I will update the website. The workshop have just completed some of the standard Dapol Class 08's with medium weathering for sale off the shelf. The weathering really has worked well and brought them alive. The cost of these is just £216.25 each Post Free to mainland UK addresses. We can also complete a sound equipped version if required, the cost for one of these weathered would be £370.00 for the sound equipped version. On the same basis we have also commissioned a set each of both the standard 10ft wheelbase planked vans and plywood vans in the early 1950's livery. These should be available around Easter 2019. Again this is subject to receiving sufficient advance orders but with these if there is enough interest there is even the chance that we may extend this to two different sets of six of both types. We are taking advance orders for these now for despatch as soon as they become available, a simple call or email can secure your order. 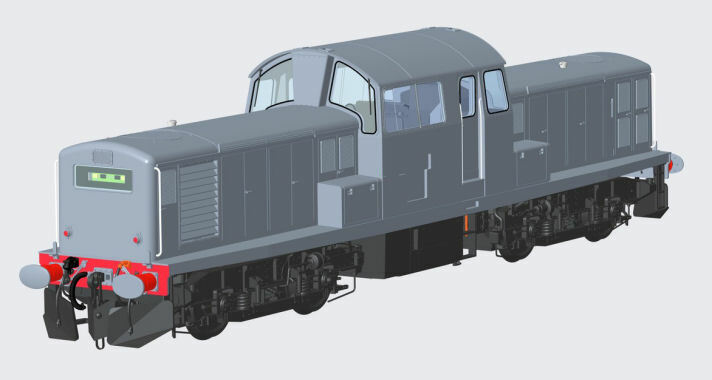 Dapol have today confirmed the new version of the Class 08 to cover the later variants and liveries. We are taking advance orders for these now for despatch as soon as they become available. The predicted release date for these is hopefully before Christmas. We have finally had the opportunity to complete thirteen Gauge 1 coaches for stock in time for the summer. Eleven are in BR maroon with Midland prefixes and two in Carmine and Cream with Western prefix. Details of these can be found on the RTR available off the shelf section within the Gauge 1 part of the website. The cost of these is £660.00 each or £635.00 each when buying four or more in one transaction. If there are specific liveries you are after we can also complete these Gauge 1 coaches with the customer's choice of livery and either clean or weathered which normally takes 3 monthes to complete. Lots of images today from Dapol after Doncaster show along with some updates on release schedules along with the official announcement in regard to the launch of the Class 121. Dapol announced the release of BR Mk1 coaches the end of last year and we have now had the first test sample images of these. Initially there will be four versions (SK,SO,CK & BSK) in a choice of 5 liveries both numbered and un-number and finally there is also the option of DCC fitted as well. This makes a total of 90 different coaches and I have now listed all of these by either type or by livery to make it easier to browse. Release date is hopefully late 2018. We are taking advance orders for these now for despatch as soon as they become available. We have now received restocks of the recently released Bachmann Scenecraft O gauge trackside accessories. The platform tractor has been an extremely popular set and only just reappeared after the initial production launch. Dapol have also announced a re-run of the ex-Lionheart Coke wagons for early next year. They have initially announced 7 planks, 7 planks with coke rails and 8 planks in various liveries. Again we are taking advance orders for these now for despatch as soon as they become available. Stocks are getting very low across all remaining liveries. We have already completely sold out of the green with small yellow panels, Raifreight Grey, BR blue with full yellow ends. As always we are also offering our numbering and weathering service through the workshops should customer's wish to take advantage of this service. Numbering a loco is just £25.00, numbering and weathering an additional £65.00. This usually take 7-10 days to complete. We can also do named examples if required at an additional £25.00 subject to the number of plates required and this can take up to 6 weeks as the name plates are made specially to order. In regard to the Large Logo Blue Class 37's it is not quite so easy as these often also feature the various depot logos and also the unusual large numbering. In the case of these there is an additional £5.00 for the depot logos and £10.00 charge for the large loco numbering. This large loco number also features on the Railfreight Red Stripe livery. We have now had delivery of all of the Heljan Class 45's and have completed all advance orders for these. For those customers who have asked us to number,name or weather the Class 45's, these are currently being processed through the workshops but please be patient as we have completed the first of these this week (un-weathered only so far) with the rest should work their way through the workshops in the next two weeks. We currently have stocks available for immediate despatch for those people who did not take advantage of our advance ordering system but be warned, stocks are running low already and Heljan have now confirmed they have completely sold out of the Class 45's. I have updated the details with the current stock situation and we have now sold out fo the first version, the Class 45 blue and factory weathered which have now all gone..
We bought all of Bachmann's remaining stock of 45xx and 4575 Prairie Tanks in Gauge 1 several years ago. We can now confirm that we have now sold out of the 4575's and are down to the last one 4575 and we are down to the last six 45xx flat top Prairies. These can be supplied "as is" in plain green, no number or insignia or, alternatively they can be supplied fully finished in either any GWR or BR livery for an additional charge. We have two fully finished Gauge 1 45xx's available off the shelf; 4512 in BR late crest un-lined green and clean finish at £1035.00 and 4555 in BR lined green early crest clean finish at £1090.00. Once these have sold there will be no more as the factory that made them has closed. Two weeks ago Dapol released the Great Western liveries of their new suburban coaches along with the first two liveries of the BR liveried coaches (LHT603 & LHT623) which have been well received and represent superb value for money. We have now bought all remaining stocks of the Great Western coaches and Dapol have no stocks. We have now sold out of the first of the Great Western sets (LHT601 Kingsbridge) and have a limited quantity of the others available. I have updated the webpage with the numbers as we count down to a sell out! We have now received all of the BR liveries as well and sold out completely of the single coaches and also LHT605 already! We have just done a stock take and we are now running very low on all remaining liveries of the Class 25 and thought it better to give people fair warning of the stock situation before we run out. There is also the option of our numbering and weathering service available for these for those people who want to take advantage of it at just £25.00 for numbering the loco and £40.00 for weathering if required with your choice of light, light body with medium chassis and roof, medium or heavy weathering. 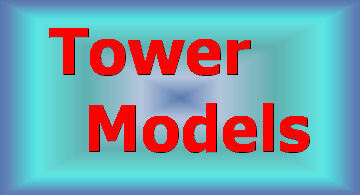 Most people think of Tower Models only as the UK's largest stockist of 'O' gauge. Apart from this we are also a major supplier of Gauge 1 locomotives, coaches and track. 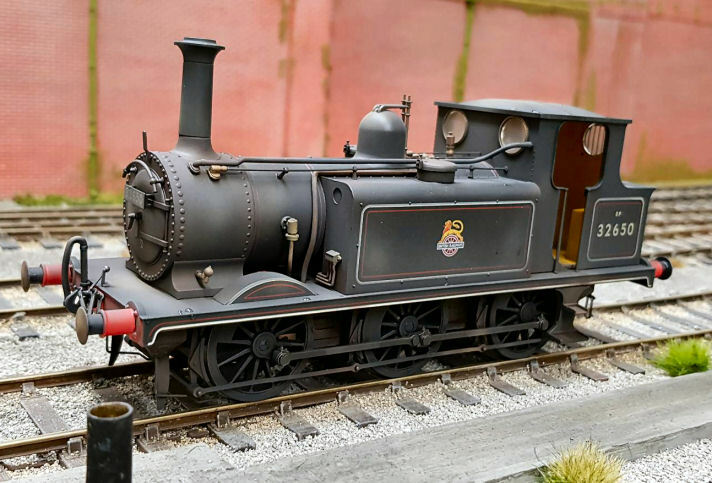 Shown here is a Tower Brass Terrier in Gauge 1 recently completed for a customer. This locomotive was hand lettered and lined in our workshops. We currently can offer a range of locomotives and coaches both off the shelf or completed to order. We have now received the brand new Heljan modern depot.. It has been designed to be modular and very adaptable to a number of situations and locations. Add-on packs are also available to extend the main kit either adding extra roads or additonal depth. Photo shows the first sample which has been painted; kit will be moulded in single colour plastic. Please note that the side bay 'bars' will also be duplicated on the lower panels on production examples. If you have not already advance ordered one of these we are still taking orders for this for immediate despatch once they have arrived and full details can be found on the relevant pages of the website. We have now bought the last remaining stocks of the AC railbus in both Light Green with speed whiskers and dark green with small yellow panels from Heljan and are happy to announce a special offer on these two versions that will run until we have sold out. The RRP on these two liveries is £495.00 with our normal price £395.00 each. The Special offer is just £299.95 whilst stocks last is on a first come first served basis. There are very few of the Dark Green with Speed Whiskers available and the offer does not apply to this livery as there are so few of these available and it has always been the most popular livery. We can offer our weathering service for an extra £25.00. We can also sound fit the railcars for an additional £175.00. We have stocked On30 since it was first intorduced in the late 1990's. Bachmann have produced an excellent range of products and we have had a good run with them. However, nothing lasts for ever and we have decided to stop stocking this range and clear all remaining stock at prices between 33% and 50% below the recommended retail price. We have altered the On30 section of our website to give an accurate list of just which items we have in stock, along with the clearance prices. This list will be updated daily until everything is sold. If the item you are looking for is not on the list, then we do not have it in stock and cannot obtain it. There will be no further deductions or bulk deals. Items are being sold at cost or below cost price so there is no room for further discounts. Orders over £150.00 sent post free to UK mainland addresses. The title to this paragraph is a link through to the remaining clearance stock. We are down to our last few DJH 'OO' locomotive kits so have decided to clear them off at bargain prices. We have only a couple of each in stock and both types are now discontinued by DJH. These kits come complete with Romford wheels and were priced at £174.50. To clear £117.50. Motor and gears available separately. 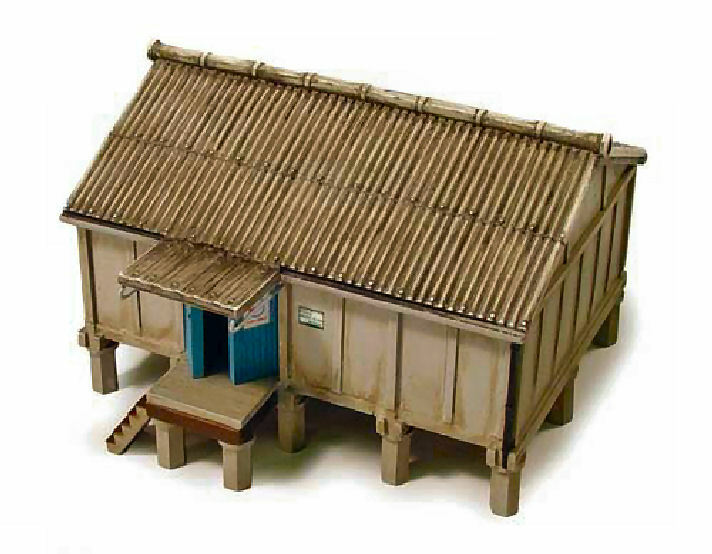 Bachmann Scenecraft 'O' gauge Building Offer. We have bought all of Bachmann's remaining stock of the above buildings range and can offer the following items on a limited offer whilst stocks last. Heljan 'O' gauge gears, A statement. There appears to be a rumour going around model railway websites that there is a widespread problem with gears splitting on Heljan 'O' gauge diesels. As the largest stockist of Heljan 'O' gauge and with consistantly high sales since the range was first introduced we feel it essential to present the facts to the public rather than destructive "Chinese Whispers"
On the very rare occasions we have seen split gears it is only with Class 35 Hymeks and Class 47 diesels. In all cases the locomotives had considerable amounts of running and it must be stressed that replacement gears are available from Heljan's service agent; Howes of Oxford. Unlike certain other model railway manufacturers, Heljan have always tried to provide spares. Overall we have had very few problems with any of the Heljan 'O' gauge range. If there were on going problems then Heljan would not of won "Model of the Year" competition so many times, or have so many repeat customers. It is a pity that such vindictive rumours can be spread and accepted by so many as true. Anyone with a split gear should contact Howes of Oxford. Anyone who has not got a split gear should stop worrying about something that probably will never happen. As we have said, it is an incredibly rare event given the total numbers sold. Gauge 'O' Guild Telford Show. Given the current economic climate Telford show went very well, the stand look very well and was commented upon by several people and we were proud of our display, so much so we thought we would put an image up of the stand. For anyone who is into 'O' gauge and has never attended the show it is the premiere 'O' gauge event of the year and cannot be rivalled for both variety and quality. If there is only one show you can attend in the year, this should be it and if considering coming from overseas this is the show you should aim to attend. The show was extremely well organised had a good atmosphere. We offer a wide range of kits and ready-to-run items from a number of sources. our aim is to offer a quality product at an affordable price. This seems to satisfy 99% of our customers. However, there appears to be a growing number of people in the model railway fraternity who expect perfection for a pitance of a price. Let me make it clear that the perfect model does not exist. It is utterly unreasonable to expect full working inside motion on any of the models we sell or any other complex working details that can barely be seen, especially at the price and no, the cab gauges don't really work! 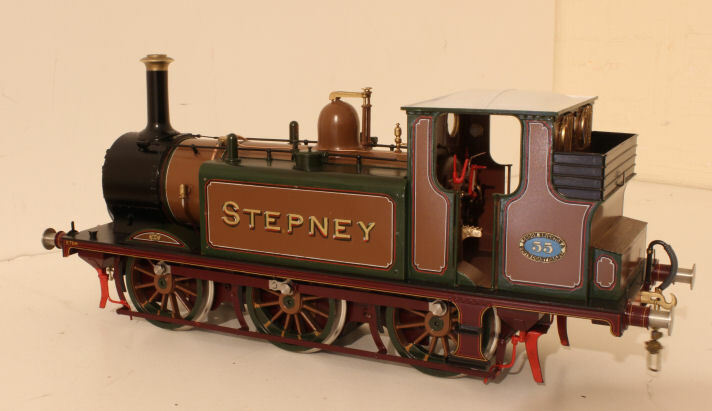 All our items are for standard 'O' gauge finescale. They are made from plastic, resin, white metal, pewter and brass. They are powered by electric motors. Real locomotives are made from iron, steel, brass and copper. they are powered by steam, diesel or electricity. If anyone wants to duplicate all the features of a real locomotive may I suggest he buys a real one. They are much bigger than ours and cost many times more than the ones we sell. At the end of the day model railways are big boys toys and meant to be fun, let's not forget it.